Receive deluxe samples of Advanced Night Repair Eye Concentrate Matrix (0.17 oz. ), Nutritious Super-Pomegranate Radiant Energy 2-in-1 Cleansing Foam (0.24 oz.) and Nutritious Micro-Algae Pore Minimizing Shake Tonic (0.24 oz.) with your $49.50 Estée Lauder purchase. Receive Supreme+ Refinishing Facial 1 oz, ANR .24 oz, Supreme + Eye Balm .34 oz, PC Envy Slurry Eyeshadow Compact, Envy Lipstick in Desirable 0.12oz, Sumptuous Extreme Mascara 0.01oz, AMBA Living x Estée Lauder Exclusive Bag with any $37.5 Estée Lauder purchase via coupon code HYDRATE . OR, Receive Take it Away MU Remover 1 oz, Resilience Multi Effect Eye Crème .34 oz, Resilience Multi Effect Night .24 oz, PC Envy Slurry 5 Eyeshadow Compact, Envy Lipstick in Desirable 0.12oz, Sumptuous Extreme Mascara 0.01oz, AMBA Living x Estée Lauder Exclusive Bag with any $37.5 Estée Lauder purchase via coupon code LIFT . 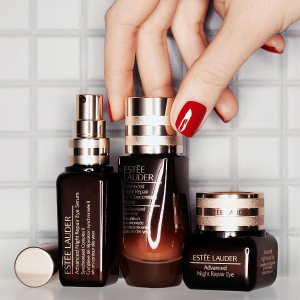 Plus, receive Resilience Multi-Effect Face and Neck Cream ($58 value) with any $75 Estée Lauder purchase. Plus, receive 26-pc gifts ($123 value) with any $125 beauty and fragrances purchase.